The more I learn about the food industry the more I realize how important it is to get back to eating “real food”. Leslie Citroen of Mill Valley is teaching the Bay Area how to get back to eating real food one chicken at a time. 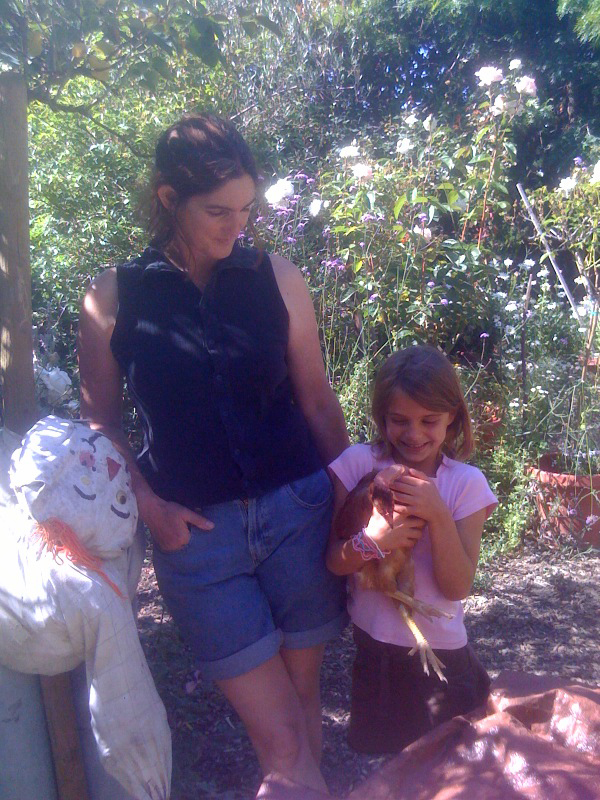 Leslie and her children run Mill Valley Chickens. They sell chickens and teach classes on everything you need to know to keep your backyard flock happy and healthy. I really enjoyed visiting with Leslie and her daughter Logan. Being in Leslie’s backyard with the chickens and talking with her adorable daughter about 4-H brought back a lot of memories. I grew up with chickens in my backyard and was a 4-H member! 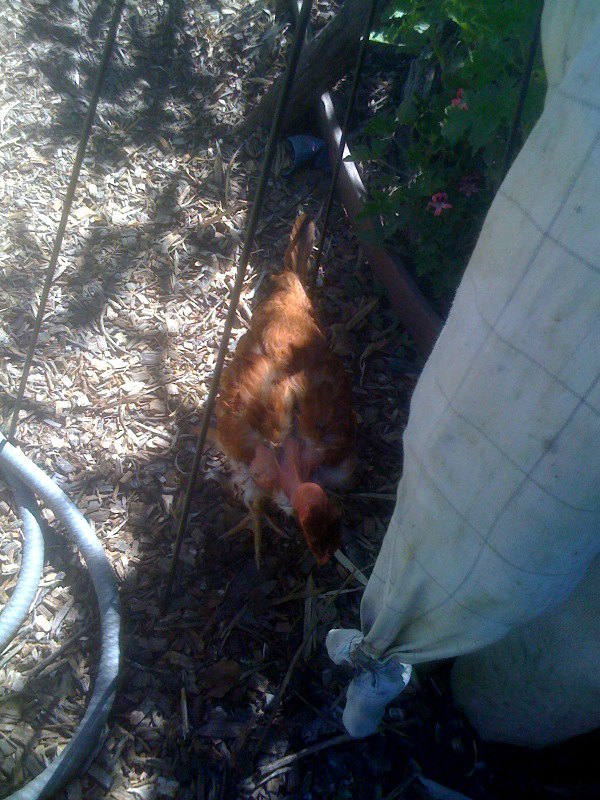 (Yes, we had chickens in Orange County.) I was impressed with 6 year old Logan’s knowledge and handling of the chickens. I saw chickens of all shapes and sizes. I even discovered a new chicken called a Naked Neck (see photo below). I learned these Naked Neck’s are popular among the boys… I think it is their almost Sci-fi creature like look. I have to admit when I first saw the Naked Neck I thought it was a hen that had been pecked by the others. I assumed she was at the bottom of the pecking order. Leslie seemed to have a weak spot in her heart for the Naked Necks, she talked fondly about how sweet they were. The chickens are actually great animals for kids. 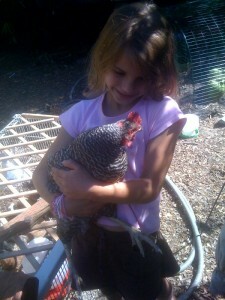 As you can see, Logan was carrying the chickens all over the yard and they seemed perfectly content in her arms. 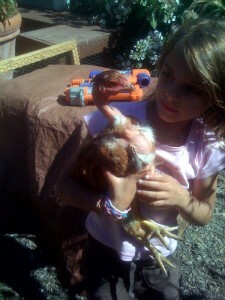 Chickens are easy enough to take care of that a 6 year old can manage it. Something fun for bored kids to do. Getting food from the source and avoiding the use of oil to ship the food to the grocery stores. Not supporting factory farmed chickens. Even though I’ve focused on kids and chickens you do not have to be a kid or have a kid to reap the benefits of your own backyard chickens. Chickens lay more eggs when there is more sun light. You will get more eggs during the summer months. 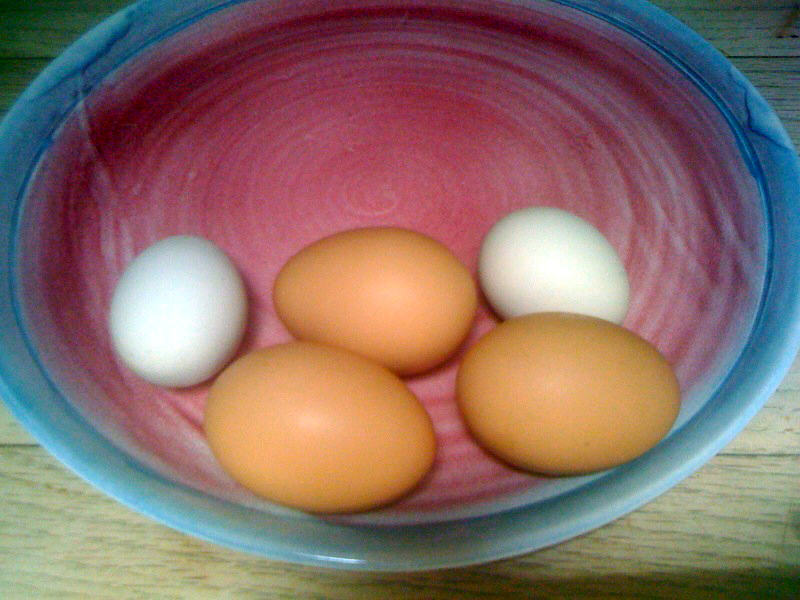 You can determine egg color by the color of a chicken’s ears. ie. white ears equals white eggs, brown ears equals brown eggs. When your chickens eat scraps and forage in your yard for bugs -eggs are far healthier and chock full of vitamins — than commercial raised eggs. Factory farmed chickens are often stored is small cages where they can’t even move and the lights are left on 24 hours a day to encourage more egg laying. Besides the cruelty to the bird imagine what the stress does to the quality of the egg. I’m not going to go in to the gory details of our food industry… I’ll save that for another time and place. Looking for something fun and unique to do this summer? 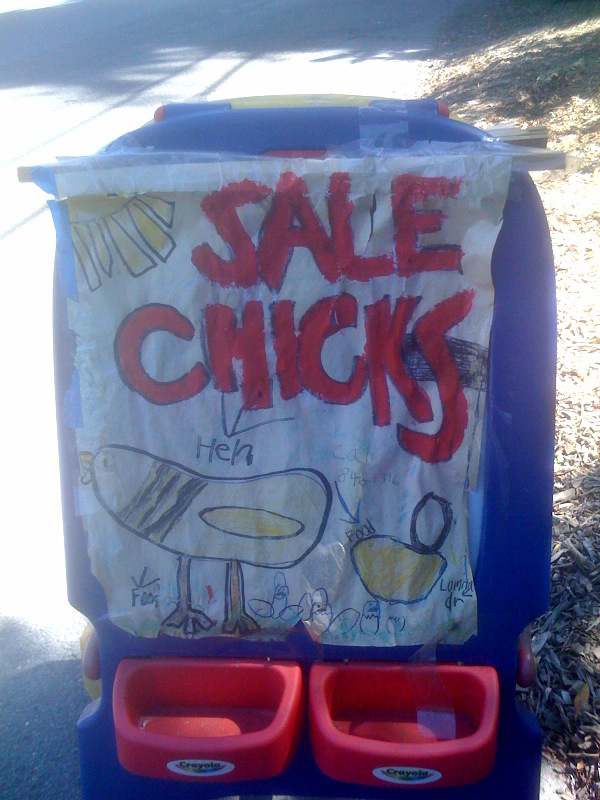 How about visiting Leslie and her family at Mill Valley Chickens? Just contact Leslie and set up a date a time. You can purchase your own backyard chicken and take one of her classes to learn all about taking care of your backyard chicken. 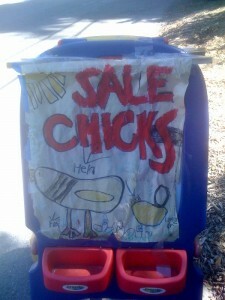 The chickens run from $15 -$25 each. Chickens range in age from 3 weeks to 3 1/2 months so they are already past the critical chick stage and well on their way to be egg laying hens. You can also purchase ready-made chicken coops from Leslie or arrange to have her build a custom one for you. In addition to the chickens, I was very impressed with Leslie. She’s a licensed general contractor. It’s not every day that you meet a female licensed general contractor! On top of taking care of the chickens, her business and her kids Leslie has a fantastic garden full of fruit, vegetables and flowers. 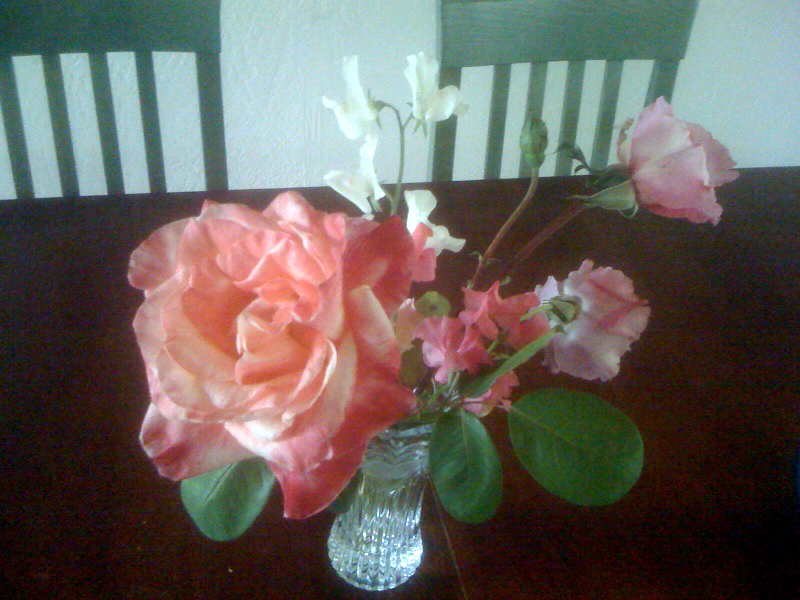 I was lucky enough to be sent home with a bouquet of fresh cut flowers from her garden, a handful of eggs and some lemons. To top it all off Leslie joined Twitter after hearing me rave about it. You can follow her at @MVchickens. If you are thinking about getting your own backyard chickens contact Leslie! She knows her stuff. Be sure to “LIKE” Sally Around The Bay on Facebook for more Raves, Rambles and Rants! ← If I can bike, so can you! By luck we found your email address. So glad to know you and the children are doing fine.